Build it your way with your choice of carbon steel or high performance aluminum construction. When weight is not a concern, choose a steel version for value and durability. If youre looking to shed a few pounds at the curb, consider the high strength aluminum configuration. Either way, youll be getting the same great design with tight approach angles and modular versatility. All winch mount bases feature steel winch plates with a 12500 lb. rating while non-winch bases feature closeout plates with provisions to later upgrade to a winch plate. All bases come complete as stand-alone bumpers and feature factory fog lamp provisions and standard flat end plates. Steel bases include basic steel D-ring tabs and plain fronts with no grill slots. Aluminum bases include steel XHD D-rings and have mesh grille slot fronts. All bumper bases and components feature welded construction and durable black textured powder coat finishes. These are complete bolt-on assemblies that require no vehicle modifications. 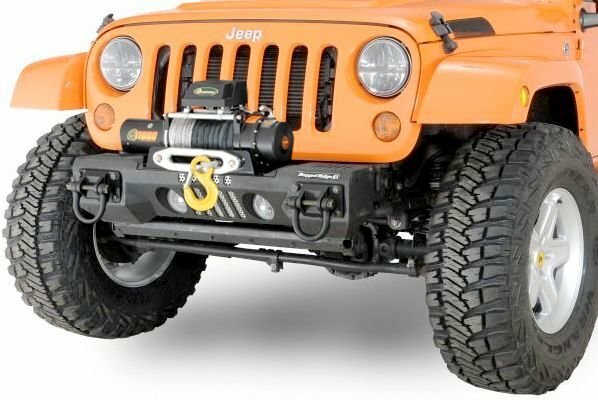 Special Note: While The Rugged Ridge All Terrain steel and aluminum components are interchangeable, they are NOT compatible with the Rugged Ridge XHD Modular bumpers.